Mothers are more present, more active, and more engaged users of social networking sites than other women, according to a study by Performics. Moreover, moms are 45% more likely than other women to say they have made a purchase as a result of a recommendation via a social networking site (42% vs. 29%). Moms are 16% more likely than other women to visit Facebook daily (85% vs. 73%). 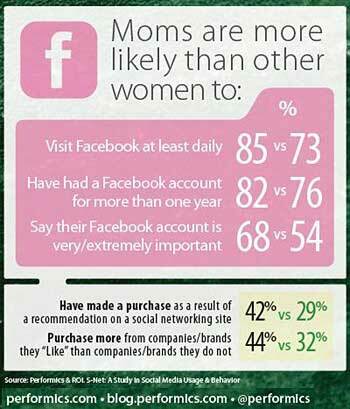 Moms are 26% more likely than other women to say their Facebook account is important (68% vs. 54%). Moms are 38% more likely than other women to purchase from those brands they "like" on Facebook (44% vs. 32%).